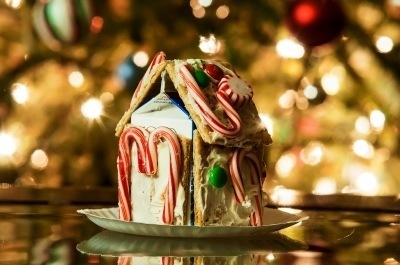 Gingerbread House Against A Background Of Christmas Tree Lights, courtesy of digidreamgrafix / FreeDigitalPhotos.net. Looking at the second half of November always makes me excited for the upcoming holiday season. 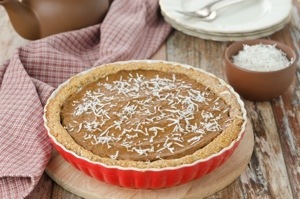 In our family we celebrate Thanksgiving, Chanukah and Christmas but no matter what celebrations you may have in store, food is usually the common denominator we all share. I really enjoy food deconstruction–taking well-known food concepts and constructs and presenting them in new, delightful and, of course, delicious ways–especially when you want to surprise your guests. I’m not a chef but I love to entertain and I love to cook and when there is a trend I like to mull it over and see if it’s right for me (I do the same thing with fashion–not every fad works for my shape and frame). Usually that means starting slowly, taking a toe-in-the-water approach. Here are the ways I tried to tackle the deconstructed food trend this year that will likely end up on my table this holiday season. Yes, you heard me… Cannolis and nachos. 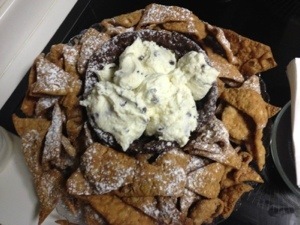 The idea is the hard cannoli shell is repurposed and reshaped into triangle shaped chips then dusted with confectioners sugar and the cannoli filling is served in a bowl and guests dip their “chips” in the filling “dip.” DiMare’s Pastry in Stamford, CT does this magical dessert (its actually where I’ve had it and is who made the confection pictured above), but I also located this recipe if you’re feeling adventurous. I got this idea sitting in a 16Handles with my kids a few months ago. It’s so hard to get them to agree, dinner time can be such a chore. I’ve never been the parent who makes different entrees for combatting family members… If I’m cooking, you’re eating…but toppings are fair game! 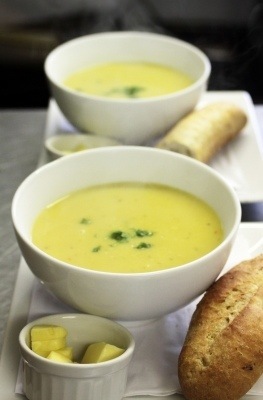 Soup, courtesy of Simon Howden / FreeDigitalPhotos.net. Start with a soup-base that’s relatively innocuous and that everyone will enjoy–butternut squash, potato-leek, even chicken broth. Then make a garnish bar, things like shredded proteins, julienned apples and pears, toasted pumpkin seeds and sliced almonds, carrots, celery, orzo and quinoa (this is just a starter list). 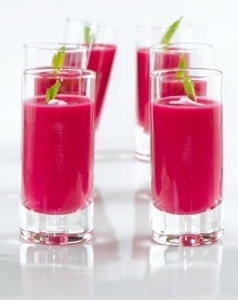 Another spin for soup lovers… Abandon the bowl and go for shooters. This works really nicely for cold soups like gazpacho and vichyssoise but I’ve also seen lovely hot soups like pumpkin, pea and white bean. Color, texture, consistency and/or garnish is key so think beets, tomatoes and get ready to purée–your shooter is clear–not to mention that surprises can be dangerous if someone decides to chug and is caught off-guard with a chunk of something. When you think of lollipops, you automatically think sweet–but, what about savory? Small meatballs can be fashioned quite nicely at the end of a stick… And you can get very creative with your meat / sauces–beef / tomato sauce, pork / traditional BBQ, lamb / yogurt sauce, turkey / chutney. Here’s a simple and diverse recipe for meatball lollipops that can get you started from foodista. Earlier this year I wrote about my swap party… One thing that is a challenge when hosting a fashion swap is the food. You have a bunch of women running around in their undies trying on clothes all day–they don’t want to feel bloated, but you also don’t want them to feel deprived, it is a PARTY for goodness sake! 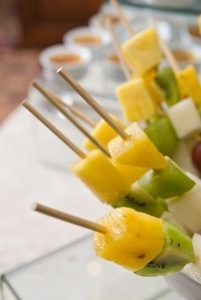 My solution: small cookie and brownie bites and fruit kebabs. They are colorful and gorgeous, can satisfy most sweet tooth cravings and when served with toppings (I chose the no muss-no fuss Nutella) measured indulgence is optional.